Listen To DaM FunK’s DJ-Kicks And A New Lo”sie "Tim”less"
DaM-FunK shared “Timeless” ahead of the release of his contribution to the DJ-Kicks series. Ahead of his edition of !K7 Records' DJ-Kicks series, DaM-Funk has shared "Timeless", a SoundCloud loosie that was recorded "late nite" on Wednesday (May 25). The track is a wandering, synth-heavy affair that speeds up and slows down without warning. DaM-FunK's DJ-Kicks will feature a track from his Nite-Funk collaboration with Nite Jewel, and a solo DaM-FunK song "Believer". DaM-FunK's DJ-Kicks will be available at midnight on iTunes, Spotify, and Bandcamp, where physical copies will also be available. For now, the mix can be streamed in its entirety via !K7 Records. 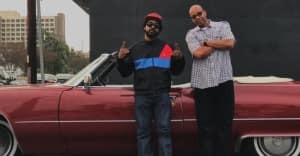 Read Next: Watch Warren G And Dam-Funk Remember Tupac As They Ride Through L.A.